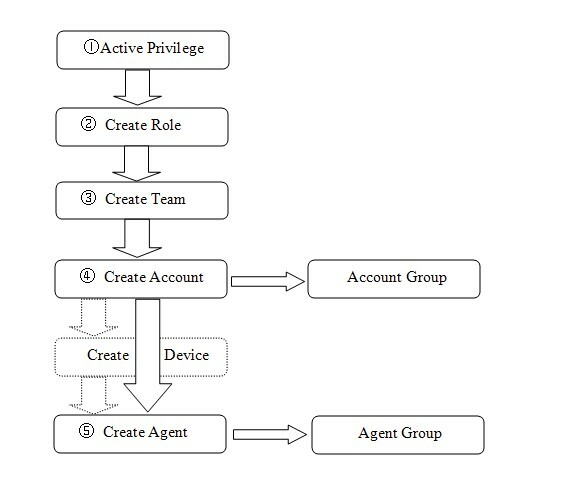 Only after we set all the accounts can we add devices, configure agents, for that each device or agent has to have an account. Different account type has different permission. For example, system admin can operate on the whoel system, team admin can act on the whole team, and user can only view things related to him. Besides account, the system also supports role configuration. Role is for defining the permission of an account to operating on different modules, including view, edit, delete and export etc. In addition, for more convenience, the sysem has introduced account group and agent group. Account group is for limit the account devices and call previlege. Agent group is for assign different tasks for agents.